Madelyn started taking her first steps right around 11 months. She teased us with three or so steps at a time and then would crawl. Perhaps once a day she’d walk a few paces, but nothing seemed to stick. Then, she gave up all together. I swore I’d have a walker at her first birthday party, but by 12 months, she was boycotting walking. Sometime between 12 and 13 months, she decided she wanted to give walking another go. She spiced things up and kept us on her toes — would she walk? Would she crawl? She did both. And soon, her confidence grew and she was walking more and more. But still, I couldn’t trust her to walk and she was so close, I wished she’d just pick Team Walking already. I was ready to have a blue tooth baby — a baby that allowed me to be hands-free. Setting her down and letting her roam was so close to being an option, but still not an option. I put her in shoes that people had gifted us, but I was realizing that these shoes were not helping her feel the ground beneath her and maybe she’d finally commit to walking if she had proper cheerleaders on her tootsies. 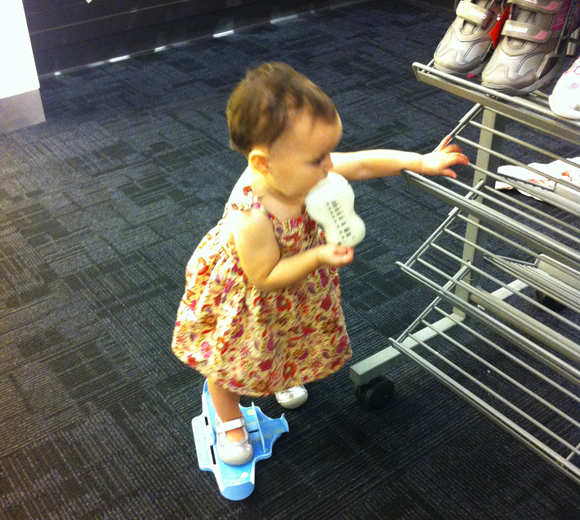 I knew absolutely nothing about toddler shoes so I took her to Nordstrom to get fitted and an education. They were so wonderful there!! 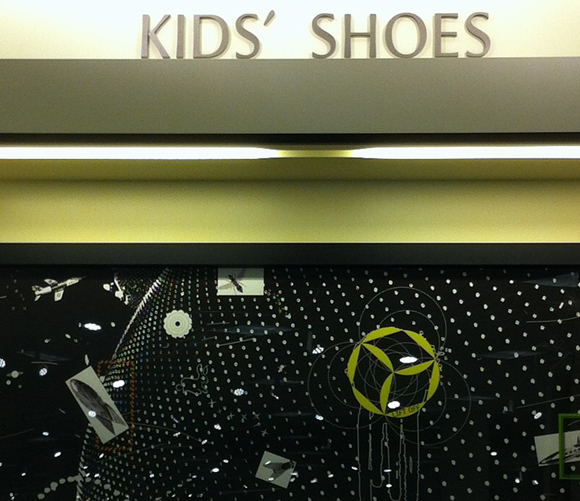 I highly recommend taking kiddos to Nordstrom for their first proper shoe fitting and purchasing experience. We learned that Madelyn is a size 4.5 and that she needed a soft sole shoe. Then, it was just a matter of choosing a pair based on those stats. I went with a pair of Stride Rite Mary Jane tennis shoes in silver. There were so many adorable options, but I thought it would be best to pick a color and style that could be worn with anything. As soon as I Velcro-ed the shoes on her feet, she only stumbled like Bambi learning to walk for a few steps and then just took off! 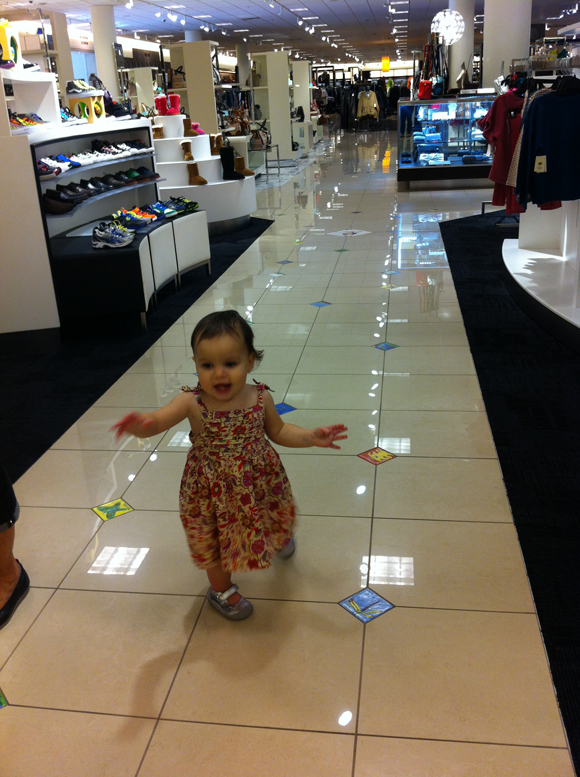 It’s almost as if these shoes had magical wings that made her fly across the Nordstrom floor. She had more freedom than Aretha Franklin. Madelyn put on quite a show. As she ran down the tile floors between the children’s shoes and clothing departments, she curated an audience who thought she was just a crack up with her jolly squeal and Flo Jo sprint. The few times she misstepped and took a tumble, she giggled the fall right off. The shoes definitely gave her the confidence and foot pillows she needed to walk properly. 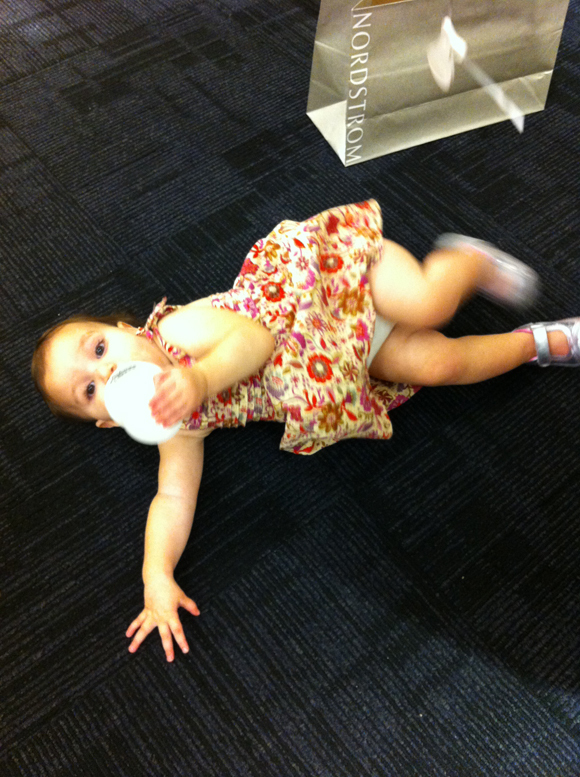 Then she went around the department playing Shoe Sales Person. 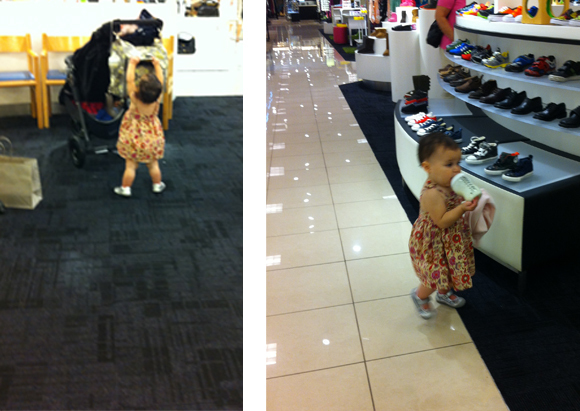 She’d pick up other shoes and hand them to my mom or me or strangers she didn’t know. It’s like she couldn’t get enough shoes! Should I be scared that I’ve created a mini Imelda Marcos? It is I, Madelyn Friedman, the Wonderful Wizard of Shooz! And then the whole thing got really tiring and she decided to revert back to being a baby. Apparently, being a walking toddler is just. too. hard. You think your life is so bad? Trying walking in some other toddler’s shoes! Just when you think your kid is all grown up and ready to help pay the mortgage, she also reaches in her mom’s diaper bag for her own lovey because nothing says “I’m a big girl in my new big girl shoes at Nodstrom” than walking around with a bottle in your mouth and a pink poodle-blanket dangling from your hand. 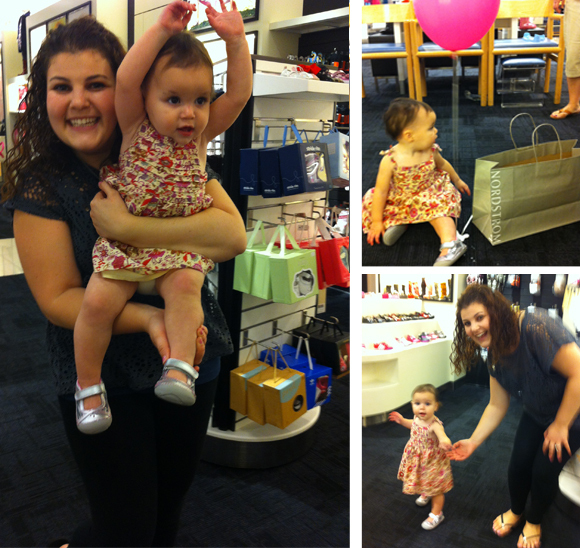 At the end of our shopping spree, our super helpful shoe sales woman gave Madelyn a pink Nordstrom balloon and took an adorable Polaroid photo in a souvenir frame! What a great way to impress an already-kvelling mom! I had to snap a few photos with my big girl. 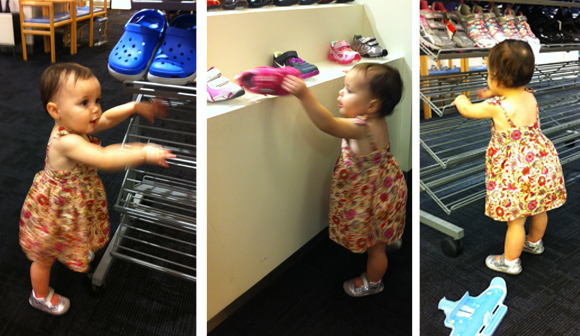 We had such a fun day shopping for her first pair of shoes, and Madelyn continues to wear them non-stop! They’re magical, I tell you! adorable-thanks for sharing. I love nordy’s!